Since I shared on my family blog about the rainbow jello I made for Madeline’s birthday I have been asked frequently how I made such beautiful jello. The process is long and you have to have a day at home to create it, but the results are worth the effort. This particular jello took 5 hours to complete, but it can be made with as little as 3 colors/flavors of jello. First layer: Mix 1 package of any flavor jello with 1 tsp gelatin and 1 cup hot water. Cool and pour into pan; refrigerate until set. It takes each layer 30 minutes to set up in the fridge. While waiting for this to set up make the next layer to cool on the countertop. Second layer: Mix 2 envelopes gelatin with 1 cup hot water until dissolved. Add condensed milk an additional one cup hot water. Once cooled pour 1 cup of the milk mixture over the set jello and refrigerate until firm. It takes 30 minutes for this layer to set up in the fridge. As soon as you put the white layer in the fridge to chill make the next color jello so that it will have 30 minutes to cool on the counter. Repeat first and second layer directions ending with a color jello layer. Once you have the jello complete you need to cover it in plastic wrap and let it set overnight to get nice and ready. Cut into 1.5 inch squares and enjoy! *Make sure the jello you are about to pour on the already set up layers is cool. If it is not it will melt some of the jello below and “muddy” your jello creation. 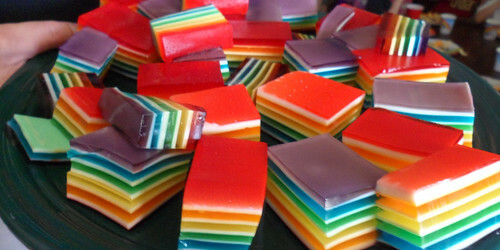 *For the rainbow jello I changed the white amount per layer to 3/4 cup in order to have enough for all layers. *You can also start with the white layer and do with just one color. Jello is your friend in this dessert and you can pretty much do anything you like. I have made a beautiful white, red, white, blue, white jello for Fourth of July before and it was amazing. The possibilites are endless.